Ancient Jewish art is mainly represented by the Temple and its fittings, of which all that is left to contemplate is the lower portion of a fortified wall. Even if this overstates the fact, it is most probable that very little distinctively Jewish art ever flourished for an extended period. The position of Judea and its history naturally discouraged the development of art, however vigorous its beginning may have been. The remains of the ancient synagogues that are now extant present very meager data, and the best preserved of the ancient ones, such as the great synagogue in Kafr Bir'im, while containing much of interest and many characteristic forms, give but little inspiration to the synagogue-builder. On the main façade of the Kafr Bir'im synagogue there were evidently three doorways with ornamented architraves, the central one being surmounted by an enriched semi-circular arch. Of the plan there is practically no indication, except that the building was rectangular, with a portico in front supported by columns. Other remains, while offering suggestions of moldings and ornament, add but little information. 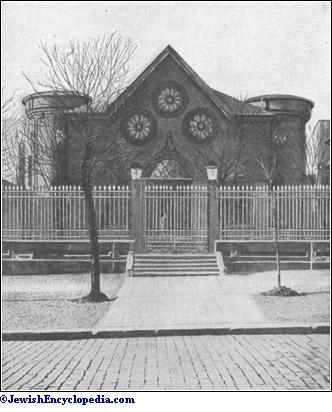 The door of the synagogue faced to the west, the Ark was at the eastern end, and the almemar was placed approximately in the center of the building; the space on either side was devoted to the men, while the women occupied a gallery reserved for their exclusive use. The regulations governing the position and number of doors and windows, and other details, seem to have been confusing and more or less neglected in the Hellenic synagogues. 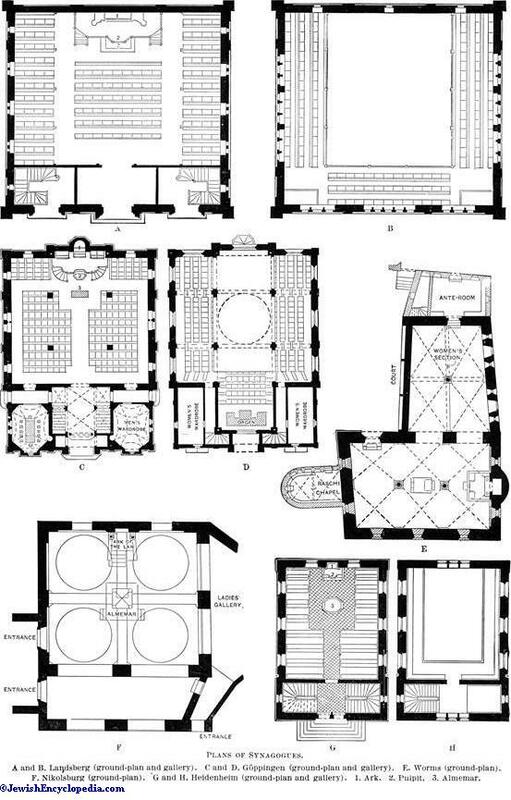 But by degrees a certain type of building was evolved—that of the basilica—a rectangular structure, with or without columns, and without what is known in church architecture as transepts, the cruciform plan of the church and cathedral being naturally avoided by Jews. The synagogue was unquestionably fashioned, up to quite recent times, in the style of architecture that prevailed in the country in which it was built. 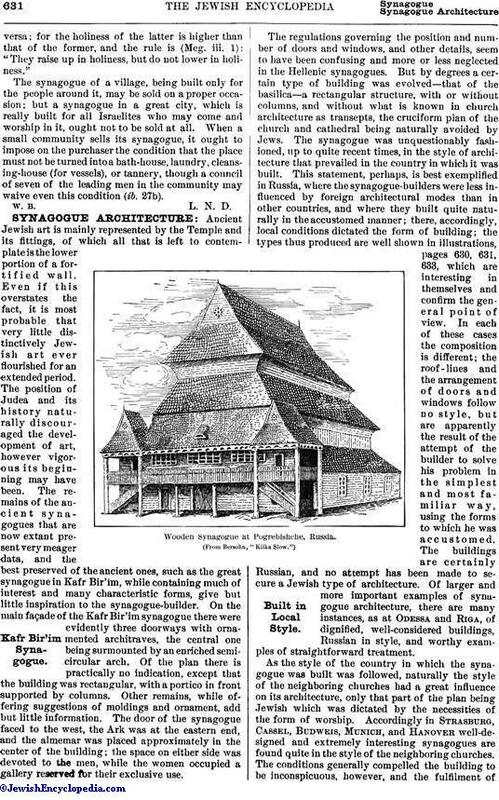 This statement, perhaps, is best exemplified in Russia, where the synagogue-builders were less influenced by foreign architectural modes than in other countries, and where they built quite naturally in the accustomed manner; there, accordingly, local conditions dictated the form of building; the types thus produced are well shown in illustrations, pages 630, 631, 633, which are interesting in themselves and confirm the general point of view. In each of these cases the composition is different; the roof-lines and the arrangement of doors and windows follow no style, but are apparently the result of the attempt of the builder to solve his problem in the simplest and most familiar way, using the forms to which he was accustomed. The buildings are certainly Russian, and no attempt has been made to secure a Jewish type of architecture. Of larger and more important examples of synagogue architecture, there are many instances, as at Odessa and Riga, of dignified, well-considered buildings, Russian in style, and worthy examples of straightforward treatment. Wooden Synagogue at Pogrebishche, Russia. As the style of the country in which the synagogue was built was followed, naturally the style of the neighboring churches had a great influence on its architecture, only that part of the plan being Jewish which was dictated by the necessities of the form of worship. 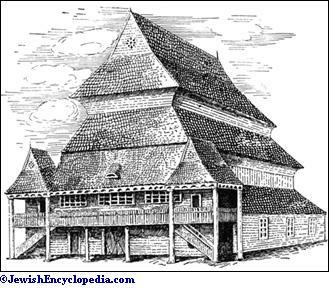 Accordingly in Strasburg, Cassel, Budweis, Munich, and Hanover well-designed and extremely interesting synagogues are found quite in the style of the neighboring churches. The conditions generally compelled the building to be inconspicuous, however, and the fulfilment ofthe Talmudical regulation that the synagogue should tower above the other buildings of the city was forbidden by papal authority. Sometimes the papal restriction was evaded by the erection of tall rods on the roof, so that the Talmudical regulation was complied with in letter if not in spirit. In Italy there are many synagogues in the style of the Italian Renaissance (see Leghorn; Padua; and Venice). Those in Padua and Venice possess interiors of great beauty, and are excellent examples of Renaissance work. So, too, in England; the interiors of Great St. Helens and Duke's Place in London are well designed, and strongly suggest some of the work of Sir Christopher Wren and Inigo Jones. Similarly, in Paris pure types of French architecture are found, and throughout Europe there are synagogues in Romanesque, Gothic, and the many variations of the style of the Renaissance. Even in Japan this law is followed, as can be seen in the illustration under Nagasaki. In America the little synagogue in Newport, R. I., was built in 1763 by the prosperous colony of Spanish Jews. It was designed by a noted architect of the day in the Colonial or Georgian style, even to the minutest detail, though it was well adapted in its plan and interior disposition to the purpose of Jewish worship. After the expulsion from Spain there was a general feeling among wealthy Sephardim that Moorish architecture was appropriate in synagogues, and many of the most famous ones in the world have been constructed in this style, although Moorish architecture is by no means Jewish, either in fact or in feeling. The two most familiar Spanish synagogues are in Toledo, one known as El Transito, the other as Santa Maria la Blanca, and both, undoubtedly very beautiful, are now preserved as national monuments. The former is a small building containing very rich decorations; the latter is especially noteworthy, and contains long rows of octagonal columns with curiously carved capitals, from which spring Moorish arches supporting the roof (see Spain; Toledo). The Alhambra has furnished inspiration for innumerable synagogues, but seldom have its graceful proportions or its delicate modeling and elaborate ornamentation been successfully copied; the fact is, the style is not flexible, and can not readily be adapted to different climates and conditions. The general results of the Moorish movement have been unfortunate; the greatest delicacy of feeling for both form and color is needed to preserve the beauty of Moorish architecture, and curiously shaped domes and towers and misapplied horseshoe arches, turrets, and pinnacles have often resulted, presenting in many cases a grotesque appearance rather than the dignity and simplicity that should have been attained. The unpleasant results may be seen in St. Petersburg, London, Philadelphia, and in many parts of Germany. Emphasizing the towers that contain the stairs to the galleries, which are invariably on either side of the main entrance, is a common device, and the Temple Emanu-El in New York is so treated. In this case the minarets are graceful and skilfully placed; but the usual result is a loss of dignity; a single central motive is more pleasing. 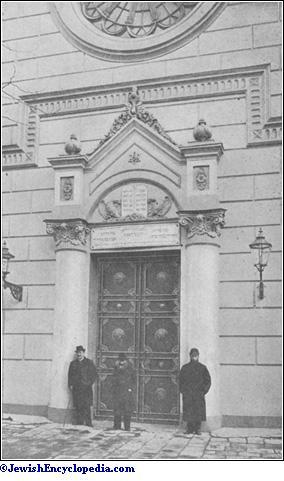 Main Entrance to the Great Synagogue at Odessa. The most successful buildings in all great architectural periods are simple in design; whether large or small, richly decorated or not, simplicity is their main characteristic, and the desire to produce the picturesque and unusual is fatal to the dignity which should characterize the synagogue. 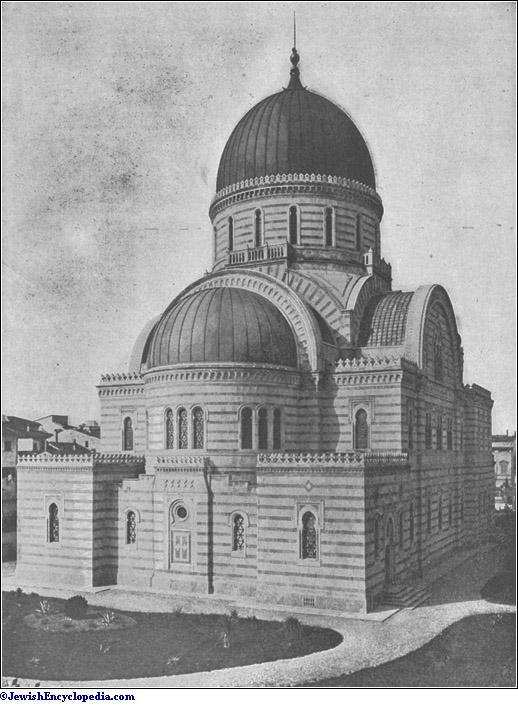 The synagogue in Milan has a well-balanced, unpretentious façade, and in Reichenberg (illustration, page 628) the central feature is enlarged and crowned by an octagonal dome, producing excellent results. Exteriors of Russian and Galician Synagogues. 1. Wilkowiszki, Russia. 2. Lutomirsk, Russia. 3. Lutsk, Russia. 4. Zolkiev, Galicia. A and B. Landsberg (ground-plan and gallery). C and D. Göppingen (ground-plan and gallery). E. Worms (ground-plan). F. Nikolsburg (ground-plan). G and H. Heidenheim (ground-plan and gallery). 1. Ark. 2. Pulpit. 3. Almemar. 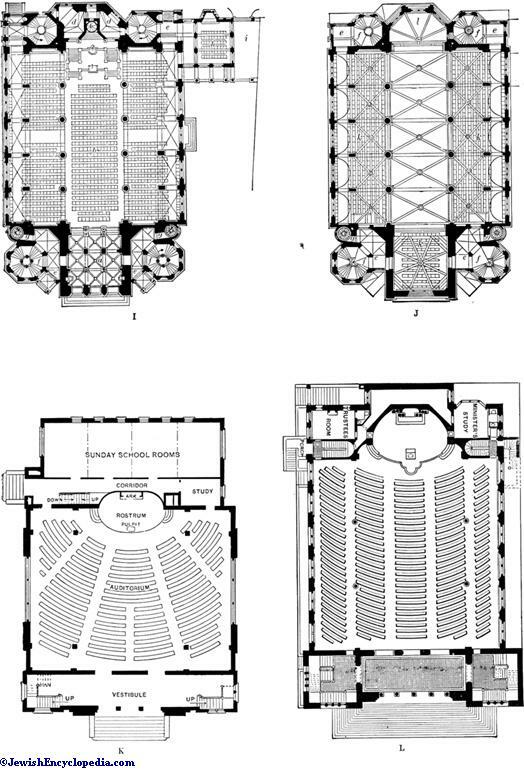 I and J. Munich (ground-plan and gallery): a, vestibule; b, men's section; c, Ark; d, minister's and cantor's rooms; e, women's entrance; f, stairs to gallery; g, side stairs; h, synagogue used on week-days; i, passageway; k, women's section on gallery; l, choir; 1, almemar; 2, pulpit. K. Indianapolis (ground-plan). 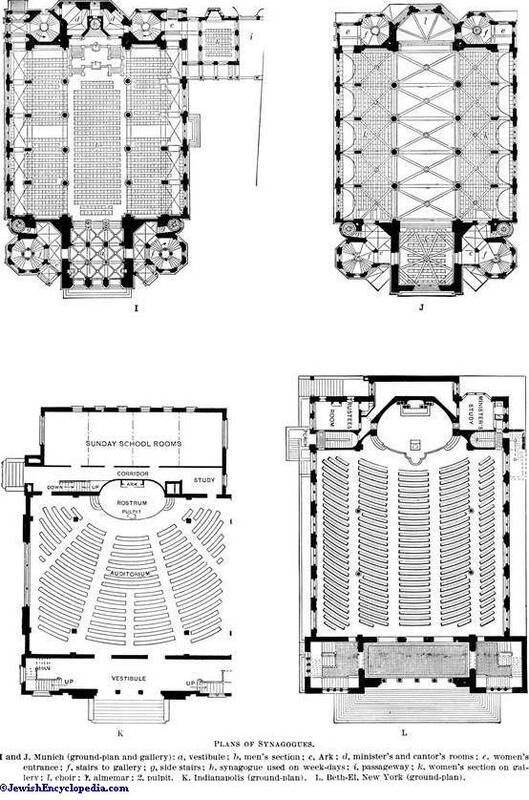 L. Beth-El, New York (ground-plan). 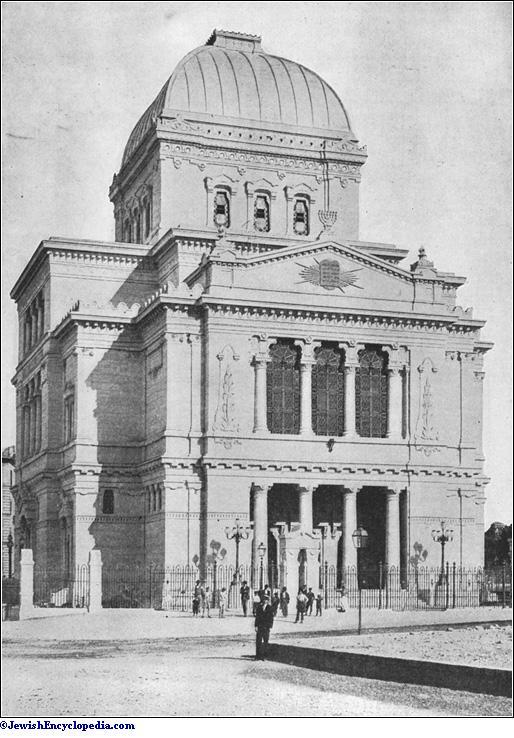 Many synagogues are designed in the Classic style, and the Shearith Israel Synagogue in New York (illustration, page 628) and the synagogue in Warsaw have four great Corinthian columns supporting pediments on their main fronts. The use of the Classic orders seems especially adapted to the synagogue, and many variations in design are possible. The Warsaw synagogue, while very ornate, is impressive, and presents many suggestions worthy of emulation. In the synagogue in Rome (illustration, page 639) the division into two stories is clearly indicated on the exterior, and each story is ornamented with columns. The whole is surmounted by a square dome, which is a favorite form with synagogue-builders. 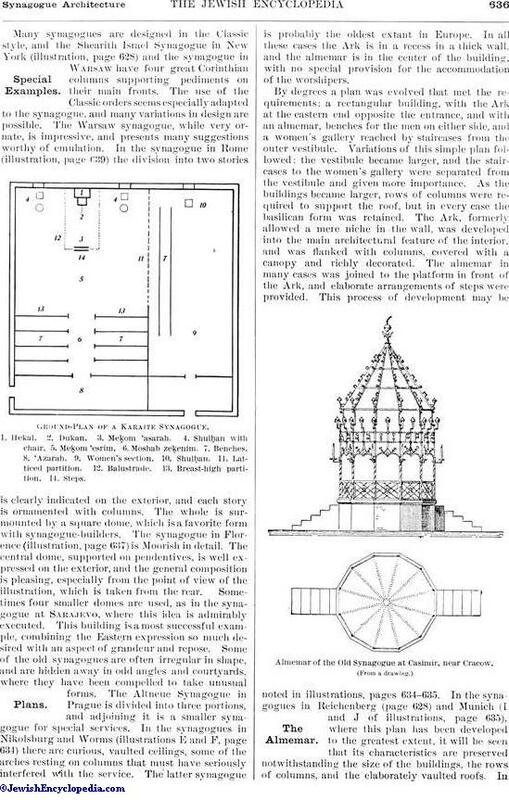 The synagogue in Florence (illustration, page 637) is Moorish in detail. 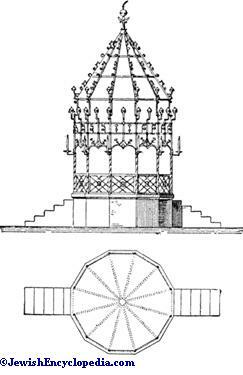 The central dome, supported on pendentives, is well expressed on the exterior, and the general composition is pleasing, especially from the point of view of the illustration, which is taken from the rear. Sometimes four smaller domes are used, as in the synagogue at Sarajevo, where this idea is admirably executed. This building is a most successful example, combining the Eastern expression so much desired with an aspect of grandeur and repose. 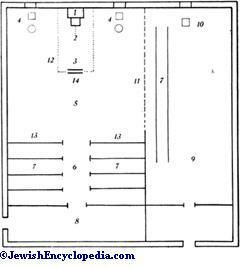 Ground-Plan of a Karaite Synagogue. 1. Hekal. 2. Dukan. 3. Meḳom 'asarah. 4. Shulḥan with chair. 5. Meḳom 'esrim. 6. Moshab zeḳenim. 7. Benches. 8. 'Azarah. 9. Women's section. 10. Shulḥan. 11. Latticed partition. 12. Balustrade. 13. Breast-high partition. 14. Steps. Some of the old synagogues are often irregular in shape, and are hidden away in odd angles in (courtyards, where they have been compelled to take unusual forms. The Altneue Synagogue in Prague is divided into three portions, and adjoining it is a smaller synagogue for special services. 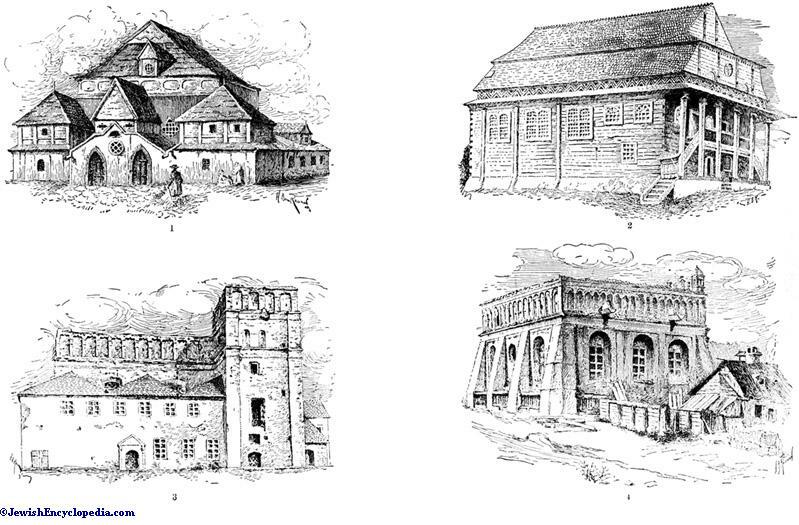 In the synagogues in Nikolsburg and Worms (illustrations E and F, page 634) there are curious, vaulted ceilings, some of the arches resting on columns that must have seriously interfered with the service. The latter synagogue is probably the oldest extant in Europe. In all these cases the Ark is in a recess in a thick wall, and the almemar is in the center of the building, with no special provision for the accommodation of the worshipers. Almemar of the Old Synagogue at Casimir, near Cracow. By degrees a plan was evolved that met the requirements: a rectangular building, with the Ark at the eastern end opposite the entrance, and with an almemar, benches for the men on either side, and a women's gallery reached by staircases from the outer vestibule. Variations of this simple plan followed: the vestibule became larger, and the stair-cases to the women's gallery were separated from the vestibule and given more importance. As the buildings became larger, rows of columns were required to support the roof, but in every case the basilican form was retained. The Ark, formerly allowed a mere niche in the wall, was developed into the main architectural feature of the interior, and was flanked with columns, covered with a canopy and richly decorated. The almemar in many cases was joined to the platform in front of the Ark, and elaborate arrangements of steps were provided. This process of development may be noted in illustrations, pages 634-635. 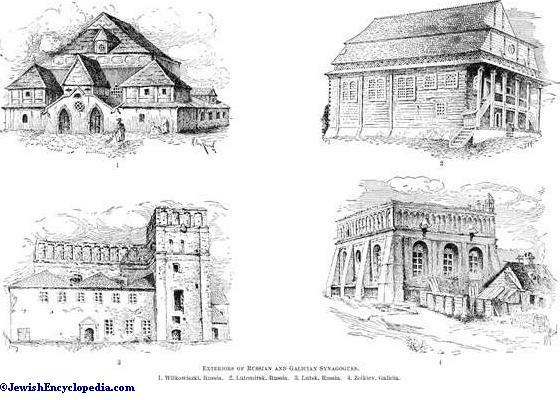 In the synagogues in Reichenberg (page 628) and Munich (I and J of illustrations, page 635), where this plan has been developed to the greatest extent, it will be seen that its characteristics are preserved notwithstanding the size of the buildings, the rows of columns, and the elaborately vaulted roofs. In the Munich synagogue there are staircases at both ends of the building, the vestibules and halls are greatly multiplied, and the women's gallery is enlarged; while there is a side entrance, as well as an aisle dviding the seats, the cruciform plan is avoided. The combination of almemar with the platform upon which the Ark rests, while seldom used in England, is becoming general with Reform congregations on the Continent and in America. It provides no opportunity for the processional and similar portions of the Orthodox service, as the carrying of the scrolls of the Law to the reading-desk, which ceremonies are necessarily eliminated as the central space surrounding the almemar disappears; but, on the other hand, much greater seating capacity is secured, and the worshipers are so grouped that all have approximately an equal view of the Ark, the pulpit, and the almemar. The desire to obtain the greatest seating capacity possible in the given space has led to many variations in the arrangement of the benches. 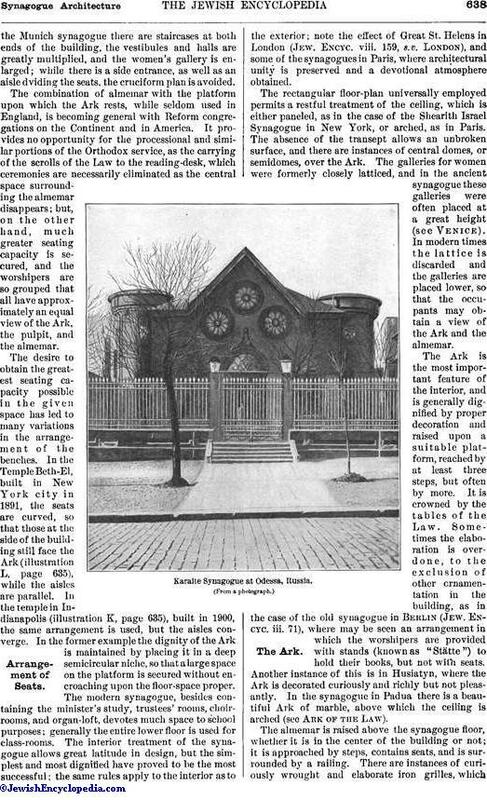 In the Temple Beth-El, built in New York city in 1891, the seats are curved, so that those at the side of the building still face the Ark (illustration L, page 635), while the aisles are parallel. In the temple in Indianapolis (illustration K, page 635), built in 1900, the same arrangement is used, but the aisles converge. In the former example the dignity of the Ark is maintained by placing it in a deep semicircular niche, so that a large space on the platform is secured without encroaching upon the floor-space proper. The modern synagogue, besides containing the minister's study, trustees' rooms, choir-rooms, and organ-loft, devotes much space to school purposes; generally the entire lower floor is used for class-rooms. The interior treatment of the synagogue allows great latitude in design, but the simplest and most dignified have proved to be the most successful; the same rules apply to the interior as to the exterior; note the effect of Great St. Helens in London (Jew. Encyc. viii. 159, s.v. London), and some of the synagogues in Paris, where architectural unity is preserved and a devotional atmosphere obtained. 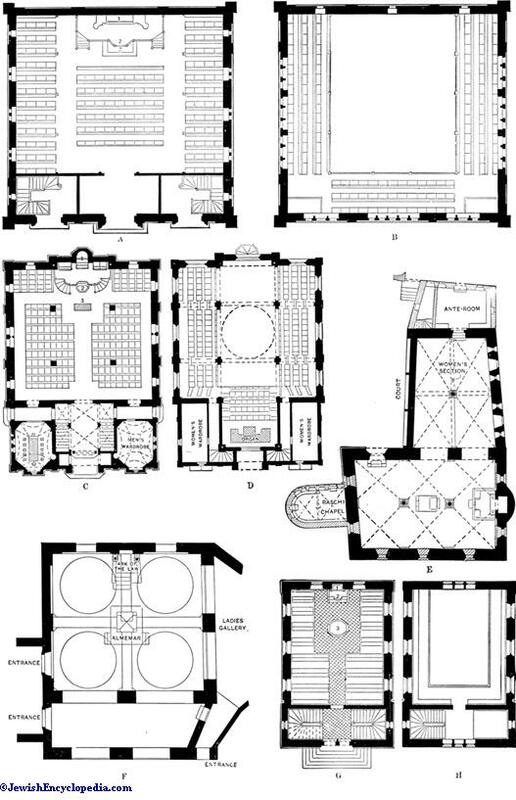 The rectangular floor-plan universally employed permits a restful treatment of the ceiling, which is either paneled, as in the case of the Shearith Israel Synagogue in New York, or arched, as in Paris. The absence of the transept allows an unbroken surface, and there are instances of central domes, or semidomes, over the Ark. The galleries for women were formerly closely latticed, and in the ancient Synagogue these galleries were often placed at a great height (see Venice). In modern times the lattice is discarded and the galleries are placed lower, so that the occupants may obtain a view of the Ark and the almemar. The Ark is the most important feature of the interior, and is generally dignified by proper decoration and raised upon a suitable platform, reached by at least three steps, but often by more. It is crowned by the tables of the Law. Sometimes the elaboration is over-done, to the exclusion of other ornamentation in the building, as in the case of the old synagogue in Berlin (Jew. Encyc. iii. 71), where may be seen an arrangement in which the worshipers are provided with stands (known as "Stätte") to hold their books, but not with seats. Another instance of this is in Husiatyn, where the Ark is decorated curiously and richly but not pleasantly. In the synagogue in Padua there is a beautiful Ark of marble, above which the ceiling is arched (see Ark of the Law). 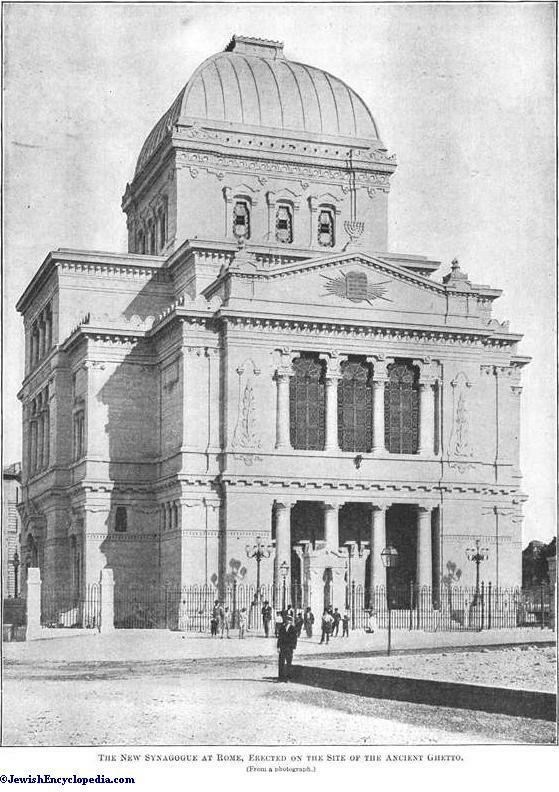 Karaite Synagogue at Odessa, Russia. 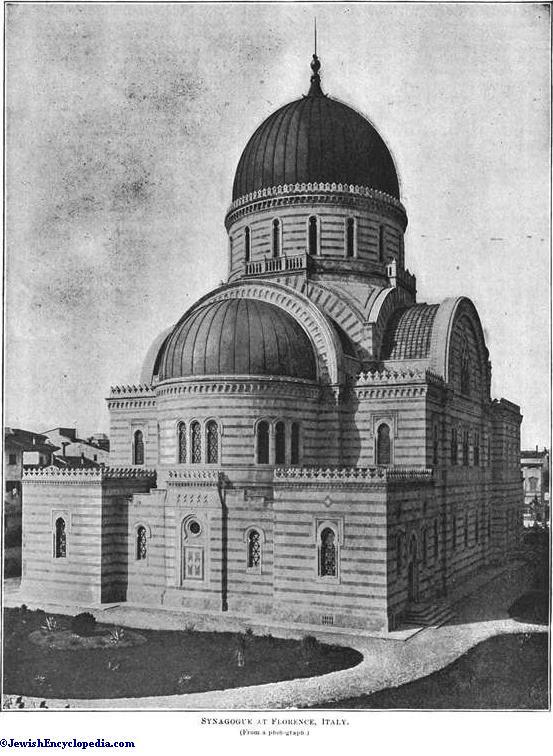 The New Synagogue at Rome, Erected on the Site of the Ancient Ghetto. The almemar is raised above the synagogue floor, whether it is in the center of the building or not; it is approached by steps, contains seats, and is surrounded by a railing. There are instances of curiously wrought and elaborate iron grilles, which may be seen in the synagogue in Jerusalem (illustration, page 626) or in Casimir (illustration, page 636). See also Cracow and Lemberg. The position of the pulpit varies; it may be placed on either side of the Ark, and is occasionally found in the center of the steps, as in the Shearith Israel Synagogue in New York (illustration, page 627). In some cases the desk on the almemar is used in the delivery of the sermon, as in the case of the Mikvé Israel Synagogue in Philadelphia (illustration, page 629), which has no pulpit. 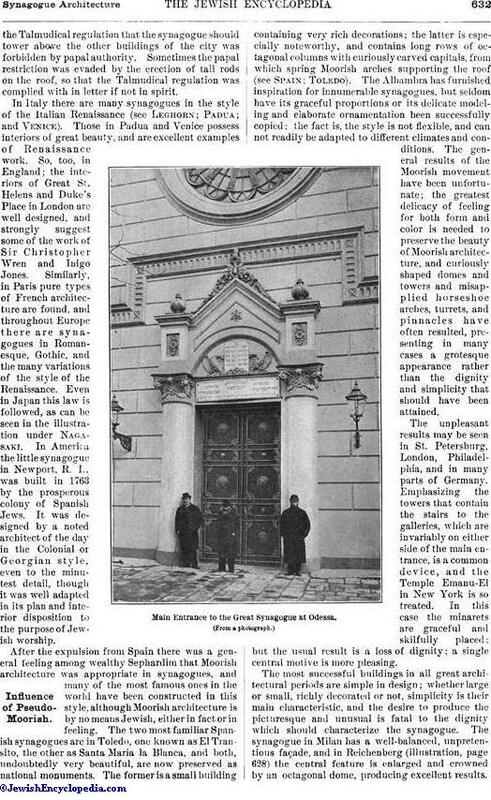 The treatment of the entrance varies according to the situation; at times the doors are approached by steps, as in Temple Beth-El, New York (illustration, page 627); in other instances the doors are flush with the street, as in the case of the Odessa synagogue (illustration, page 632). In the desire to secure abundant light, good acoustics, large seating capacity, and comfort for the worshipers, modern synagogues have in many cases lost the suggestion of devotion. There are but few emblems which may be used that are characteristically Jewish; the interlacing triangles, the lion of Judah, and flower and fruit forms alone are allowable. The perpetual lamp hangs in front of the Ark; the tables of the Law surmount it. The seven-branched candlestick, or menorah, may be placed at the sides. Occasionally the shofar, and even the lulab, may be utilized in the design. Hebrew inscriptions are sparingly or seldom used; stained-glass windows, at one time considered the special property of the Church, are now employed, but figured subjects are not used. The only plan in existence presenting the interior arrangements of a Karaite synagogue is that of S. Weissenberg (in "Globus," lxxiv. 142), which is here reproduced (page 636). The synagogue, which is known as kenesah, is always built north and south, and is divided into two parts, for men and women. In the women's section, which is separated by a low grille from that of the men, there are two rows of seats (7), and a table (10) upon which to place the Bible, which each woman kisses as she enters the building. The men's section is divided into three parts, one known as the "meḳom 'asarah" (3), or place of the ten elders, in which is the Ark (1), and the "dukan" (2), or place for the reader, which is a small desk or pulpit. On each side are tables with seats (4) for the first and second readers. Steps (14) separate this section from the second section, the "place of the twenty" ("meḳom `esrim") (5), and this again is separated by a balustrade (13) from the section known as the "moshab zeḳenim" (6), or seats for the aged, each of which contains a desk or box, and a receptacle for shoes, which must be removed before treading the holy soil. The vestibule (8) is termed "azarah." The pulpit and the place for the twelve elders is surrounded by a balustrade (12). It is somewhat difficult to understand the object of placing the more aged members of the community in a portion of the synagogue away from the body of the hall, but the probable reason is that the younger members are obliged to stand in the center (5) during the long services, while the place for the elders and the aged is provided with seats. 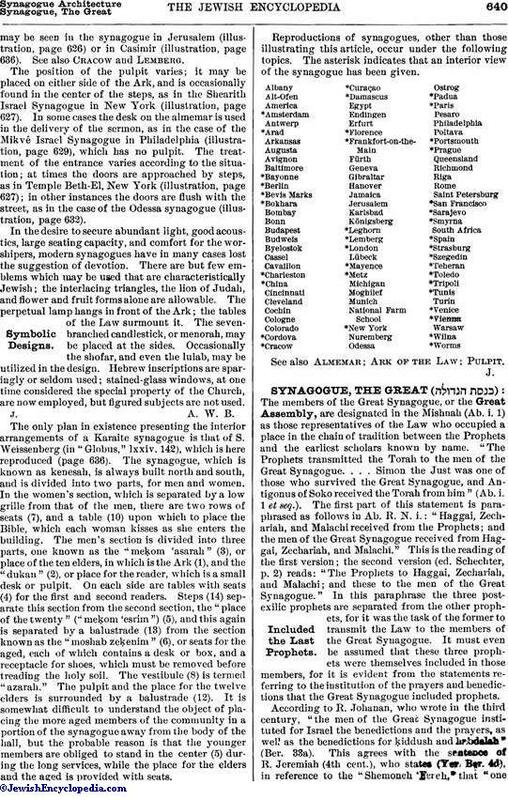 Reproductions of synagogues, other than those illustrating this article, occur under the following topics. The asterisk indicates that an interior view of the synagogue has been given. See also Almemar; Ark of the Law; Pulpit.